Welcome to the March eNewsletter. BNF 71 is now published! Read on for more details. Remember, NICE no longer supply a March print edition to eligible health professionals, so see below for details of how to order your copy and the preferential pricing for bulk orders and members of various professional associations. Elsewhere in this month's eNews you'll find new advice issued by the MHRA to prescribe and dispense levonorgestrel-releasing intra-uterine devices by brand name; updated information about the dosage and side-effects of nicorandil; new information about the licensed indication of prucalopride; updated guidance on the management of irritable bowel syndrome, and guidance on diverticular disease and diverticulitis. Finally, we're introducing a brand new function on MedicinesComplete, which allows the evidence grading of selected content to be displayed - see more. BNF 71 (March 2016) has been revised and revalidated to reflect changes in product availability, emerging safety concerns and shifts in clinical practice. 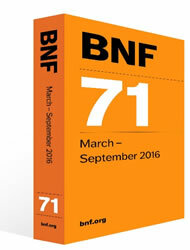 Out now, BNF 71 will help you prescribe the most effective drugs and minimise the risks, improve your patient care and comply with best practice. Its improved and redeveloped structure gives you quick and easy access to the information you need, helping you make better choices. Order now - see the box below for details. To order the March 2016 edition, visit the Pharmaceutical Press website. A print subscription is the best way to ensure access to the latest copy of BNF as soon as it publishes. Preferential pricing is available for bulk subscriptions - please contact subscriptions@rpharms.com. Outside the UK, content is available via a subscription to MedicinesComplete. For more information contact sales@medicinescomplete.com. BNF is also available as an eBook. Find out more here. We offer preferential pricing for bulk orders and for members of various professional associations. So if you are buying on behalf of a CCG, Health Board, NHS Trust or other organisation, contact us here. GPs should contact their CCG direct, who can obtain discount when placing a centralised bulk order. Recommendations made in selected, revalidated content of BNF Publications have been evidence graded to reflect the strength of the recommendation. The text to which the evidence grading applies is highlighted followed by a five-level grading symbol, from A to E. Clicking on the symbol will redirect to How BNF Publications are constructed, which includes an explanation of the grading system. The green evidence grading icon at the top of the page allows this display to be toggled ON and OFF. For further information, see the ipratropium bromide and caffeine citrate drug monographs. For more details about newly, revalidated treatment summaries which also display evidence grading, see BNF update below. The MHRA has advised that as levonorgestrel-releasing intra-uterine devices vary in licensed indication, duration of use and insertion technique, they should be prescribed and dispensed by brand name in order to avoid inadvertent switching. For further information, see levonorgestrel. The monograph for nicorandil has been updated with new indication and dose information. Nicorandil is now indicated as second-line prophylaxis and treatment of stable angina in adult patients and can be increased if tolerated to 40 mg twice daily. For further information, see nicorandil. The MHRA has advised that nicorandil can cause serious skin, mucosal, and eye ulceration; this includes gastrointestinal ulcers, which may progress to perforation, haemorrhage, fistula or abscess. If ulceration occurs, treatment with nicorandil should be stopped and alternative treatment options considered. For further information, see nicorandil. The monograph for prucalopride has been updated. Prucalopride is now licensed for the treatment of chronic constipation in both men and women (previously women-only) when other laxatives fail to provide an adequate response. For further information, see prucalopride. This treatment summary discusses the drug and non-drug treatment options of irritable bowel syndrome, including diet and lifestyle, antispasmodic drugs, laxatives and anti-motility drugs. The evidence grading for recommendations in this content is displayed on MedicinesComplete. For further information, see irritable bowel syndrome. Diverticular disease is a condition where sac-like protrusions of mucosa through the muscular colonic wall cause intermittent lower abdominal pain. Diverticulitis occurs when this is associated with inflammation or infection. This treatment summary discusses the treatment options for the symptomatic relief of diverticular disease and the prevention and treatment of complicated and uncomplicated diverticulitis. The evidence grading for recommendations in this content is displayed on MedicinesComplete. For further information, see diverticular disease and diverticulitis. To review other changes in the BNF, click on changes. To review changes in BNFC, click on changes. Thank you to everyone who replied to our survey about this eNewsletter. We are collating your replies, and will draw upon your suggestions to provide you with a better and more useful newsletter in the months to come. Reminder - you can keep up to date with clarifications, corrections and updates to BNF Publications here. Reminder - you can find an interactive PDF from CPPE explaining how to use the restructured BNF here. Prices of all branded medicinal products in the BNF and BNFC are now updated monthly. Prices of generic preparations of medicinal products are updated every 2-4 months, to coincide with print editions of BNF and BNF for Children. The BNF team keep price information up to date using data sourced from the NHS dictionary of medicines and devices (dm+d). Drug Safety Update is a monthly newsletter from the MHRA and Commission on Human Medicine. Please follow this link to review this month's Drug Safety Update. Please let us know if there are any issues that you would like us to address in eNewsletters. We welcome your feedback. If you have any comments or suggestions please let us know at enewsletter@bnf.org. Subscribe to this eNewsletter here. Copyright © 2016 BMJ Publishing Group Ltd and the Royal Pharmaceutical Society of Great Britain. All rights reserved. Copyright © 2016 BMJ Publishing Group Ltd, the Royal Pharmaceutical Society of Great Britain and RCPCH Publications. All rights reserved. If you do not wish to receive such mailings in the future please click here to unsubscribe. Pharmaceutical Press, 66-68 East Smithfield, London, E1W 1AW, United Kingdom.